The exhibition entitled „From Krakow to Castle Rock. Jagiellonian University’s Archaeological Investigations within Canyons of the Ancients National Monument” will present the photos, artifacts and 3D models and reconstructions from the Polish archaeological project that has been con¬ducted since 2011 in the Mesa Verde region, southwestern Colorado in the North American Southwest. The project focuses on the study of the settlement structure and socio-cultural changes that took place in Ancient Pueblo culture during the thirteenth century A.D. 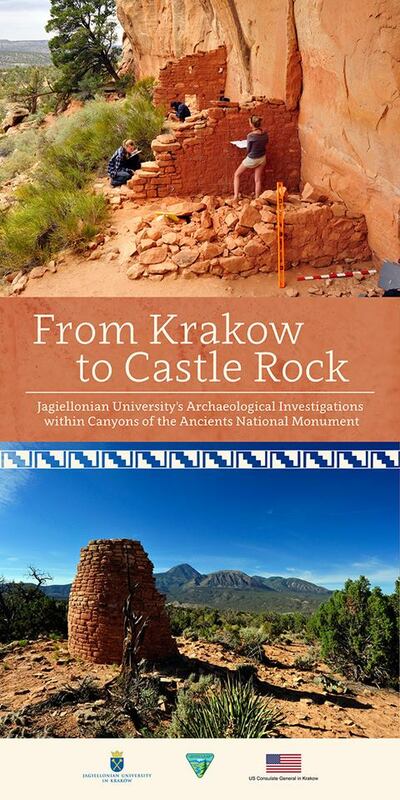 This project is being conducted by the Institute of Archaeology, Jagiellonian University in Kraków, Poland in cooperation with the American institutions: Crow Canyon Archaeological Center and the Canyons of the Ancients Visitor Center and Museum (US Bureau of Land Management), Colorado. From the beginning, the US Consulate General in Krakow has also been a partner of the project. The project director is Dr. Radosław Palonka from the Institute of Archaeology at JU.